This species is presumably named after the great King Aegeus of Ancient Greece. 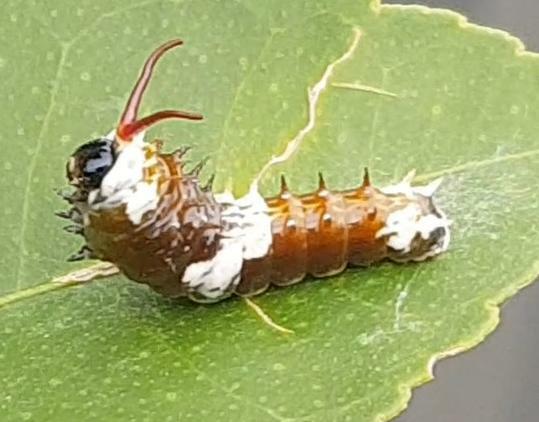 Although this Caterpillar is a pest on suburban Lemon trees, it is one of the most interesting caterpillars in Australia, Both its structure and its behaviour have evolved to an extraordinary degree to give it protective mechanisms against predators. 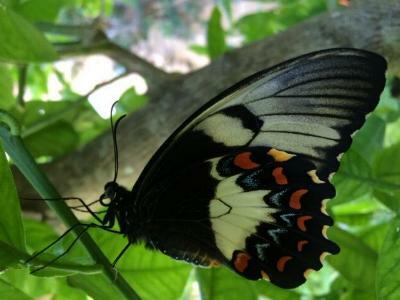 It also grows into one of the largest butterflies to grace suburban gardens. 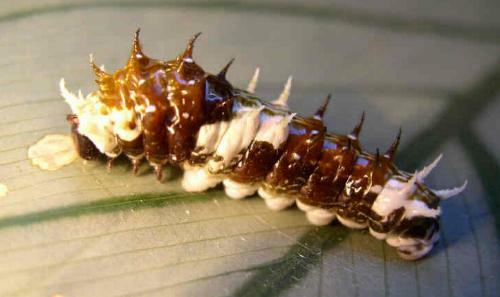 The early instars of this caterpillar are kite shaped, and dark brown with three white patches: one on the thorax, one above the the first pairs of prolegs, and one on abdominal segments 8 & 9. It is covered with black or white spines that are quite soft. The young caterpillar often sits by day on the top of a leaf, and resembles a bird dropping. 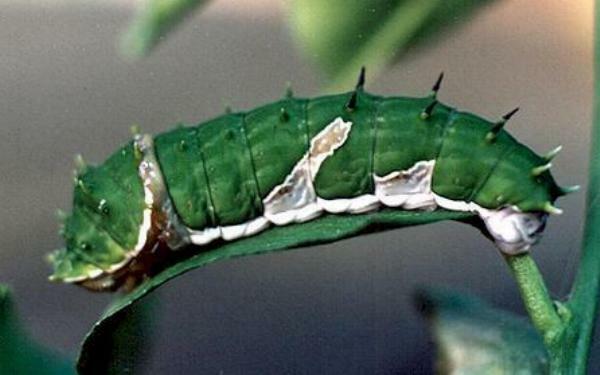 Later instars are green with white diagonal patches. 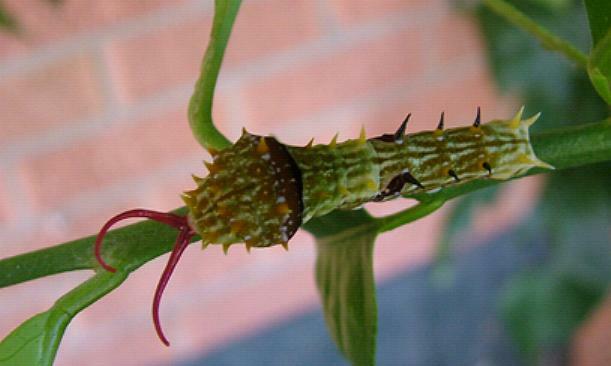 The last instar reaches a length of 6 centimetres, and has no spines. It is coloured yellowish green with narrow stripes or patches running obliquely upward and backward from the lower edge of the thorax to segments 4 & 6. These stripes vary in colour from pale brown to white, and are edged with iridescent mauve or blue. Hardy Orange ( Poncirus trifoliata ). Lanoline Bush ( Zieria smithii ). Parsley ( Petroselinum crispum, APIACEAE ). Those feeding on the latter developed faster than those feeding on Citrus! When disturbed, the caterpillars are inclined to rear up at the front,and briefly evert a red forked osmeterium from behind the head. Photographing the eversion of the osmeterium is a challenge as the eversion is often very brief. 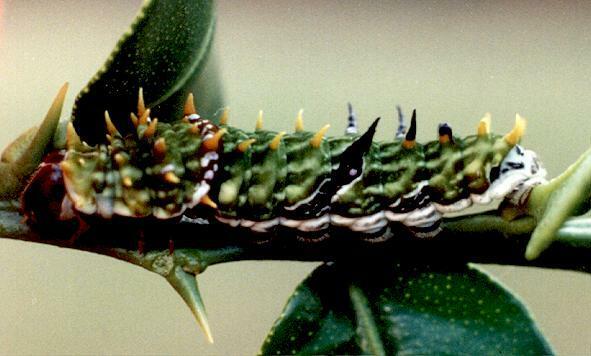 At the same time as projecting the red fork, the caterpillars also produce a citrus smell. There is evidence that the production of the smell is not actually related the erection of the osmeterium, but is a separate behaviour. 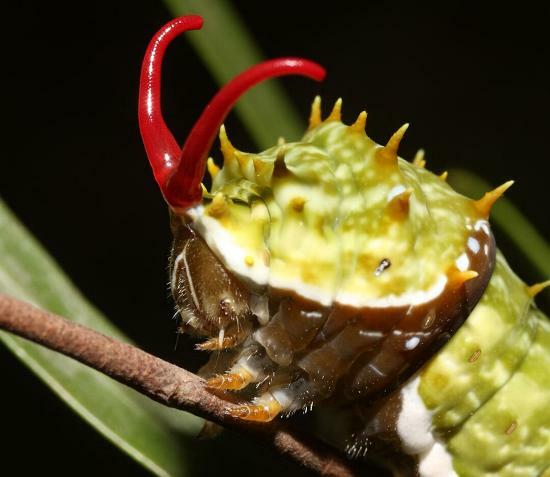 The caterpillar is a very noisy chewer, making enough sound sometimes to be found by sound alone. 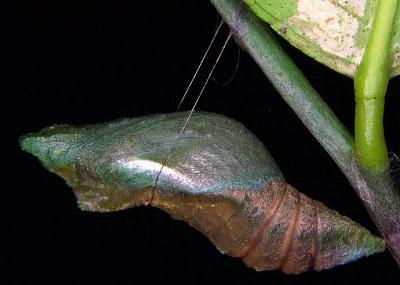 The pupa is quite stout, and is grey, green or brown. It is secured to a stem of the foodplant by a cremaster and girdle. The pupa looks remarkably like a leaf. Metamorphosis may take from one to six months, depending on the season. The adults have a wing span around 12 cms. 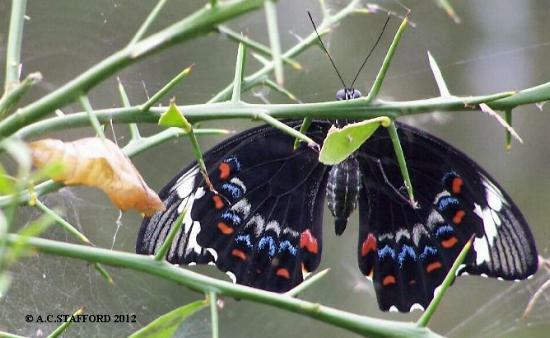 The male and female butterflies differ slightly. The male has black forewings, each with a white diagonal band across each wingtip. 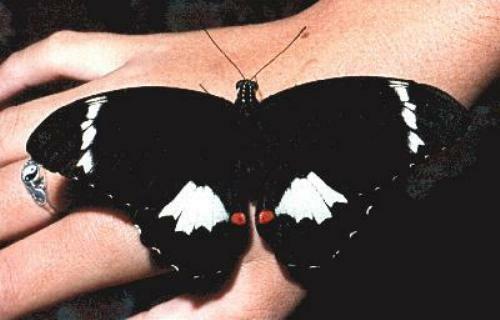 Each hindwing is black with a large white or cream patch, and one red spot. 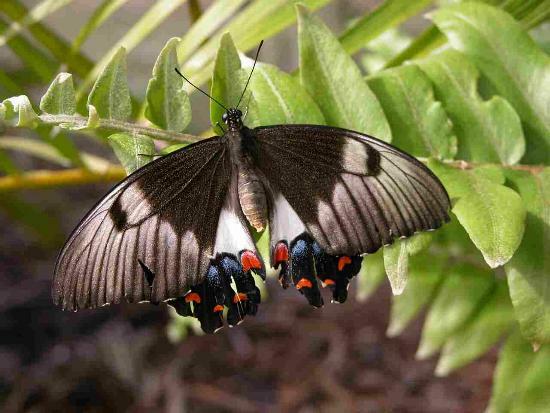 The underside of each forewing is grey with black veins, and has the diagonal white stripe across the wing tip. 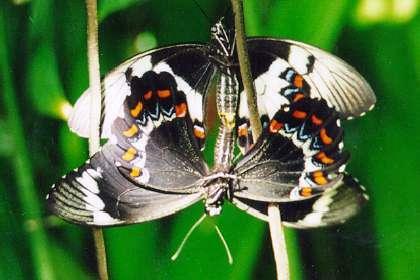 The undersides of the hindwings are black with subterminal arcs of red, white, and blue crescents. The female is similar but browner, with a large white patch on the forewings showing brown veins. Her hindwings each have a row of red chevrons and another of blue chevrons. 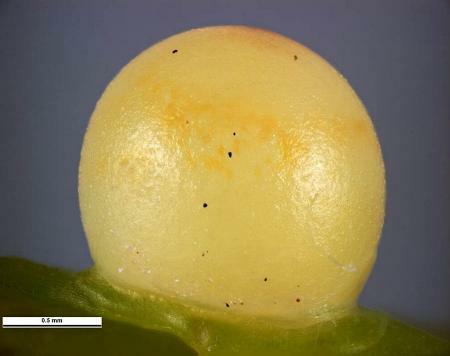 The eggs are white and spherical, with a diameter of about 0.5 mm. They are laid singly on top of a leaf or shoot of a foodplant. CSIRO Publishing, Melbourne 2000, vol. 1, pp. 267-269. London (1803), Part 1, p. 73, and also Plate on p. 72. Earthling Enterprises, Brisbane, 2005, pp. 33, 65.